…the rich get richer and the poor get poorer” was a line from a twenties song popular through most of the last century—probably as much for its social commentary as for its musical appeal. It should be coming back into fashion again, given the current statistics on exactly who is benefitting from the quantative easing (QE) being sprayed about just now. 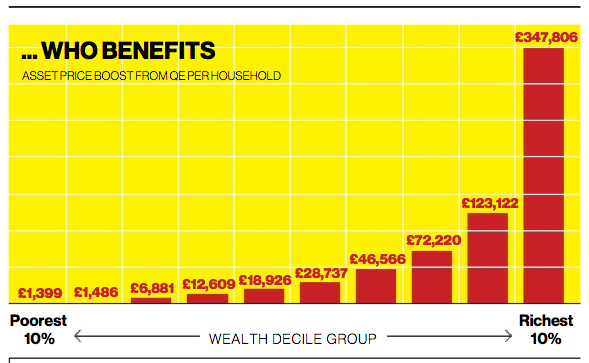 Today’s Independent contends that it is almost exclusively the rich. Now, Osbo and Mervyn are not the first to dream up the financial strategy of stuffing money into the pockets of the already-rich in order for there to be a ‘trickle-down’ effect that benefits the less wealthy as the rich spread their good fortune around. Ronald Reagan excused a massive series of tax breaks to wealthy Americans in the early eighties as a means to get a sluggish economy whirring. The economy did revive but only because he also spent trillions he didn’t have on the military. That bankrupted the ‘evil empire’ Soviet Union—but also saddled the US with a public debt that stands at $15 trillion (or $50,000 for every American still breathing after hearing that shock news). Many of us more mature citizens grew up in the last century being taught not to spend what we didn’t have. The national equivalent of that was for the country’s Treasury to simply print money without the economy to support it. Such an approach had done for the Weimar economy in the 1920’s (and paved the way for Hitler); the same strategy has once-prosperous Zimbabwe on its economic knees under Mugabe. 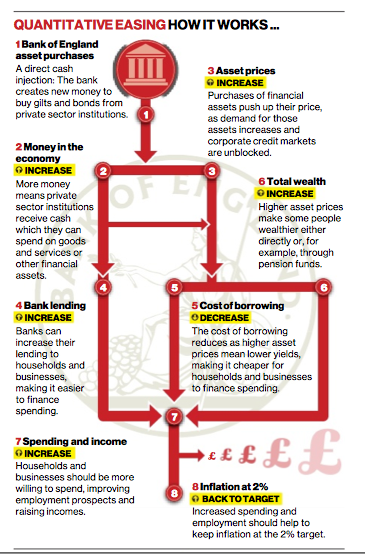 Step 4 has a uniform effect only if the banks lend across the affluence spectrum. Over the last four years of pause in growth and outright recession, a more rapacious and self-serving pile of bastards than the banks have been hard to find. Money has been provided to them but, after having their collective fingers burned by over-speculative commercial brethren, the retail end have made outrageous demands for small loans and sit on the money with the fierceness of terns protecting their breeding colony. Benefits only accrue if the value of the currency holds up. The only things holding Sterling up above the deep fiscal hole we are digging is the even-more-profligate approach by the US and the fiscal irresponsibility of the PIGS (Portugal-Italy-Greece-Spain) so that all three of Sterling Dollar and Euro are suspect in global eyes. If Greece defaults and the Euro stabilises, we’re in trouble as our main trading partners do so in Euros, which will become expensive. We can only afford the massive public debt that all this is causing (£600m more in July when it should have dropped £2-3bn) because interest rates are low AND we still enjoy an AAA credit rating on world markets. Should either—or, heaven forfend, both—go south, we will be in deep puckey. Public sector net debt was £1,032.4 billion at the end of July 2012 (equivalent to 65.7% of GDP). Currently around 2%, if bond yield rates rose to just 3% (Spain’s are over 6%), we would pay an extra £10bn in interest—or one third of the entire Scottish Government budget. A more egregious poster for the Communist Party is hard to imagine. While it is a fact of life that money begets money and that bankers fall over themselves to lend money only to those who don’t need it, for any democratic government that purports to represent the people as a whole (and not some nepotistic subset) to have created this almost beggars belief. That they blithely continue it is morally bankrupt. We haven’t heard much about “we are all in this together” from Cameron recently. I wonder why. This entry was posted in Commerce, Community and tagged quantative easing; economy; wealth sharing. Bookmark the permalink.